With the latest Kindle for iOS app, Amazon is for the first time offering in-app book searches and previews, the latter including a clever mechanism for purchasing an e-book without having to pay out a percentage to Apple. The latest Kindle for iOS version 3.9 introduces a new feature called "Free Sample Search," which lets users look and download samples of books from Amazon's vast catalog. To avoid Apple's mandated 30 percent cut of purchases, the app kicked users out to Safari, where they would have to search for titles on Amazon's website.
" will appear. From here, users can either close the sample, or generate an email to themselves with a purchase link for the book. According to Amazon, "millions" of books now have free samples for iOS, but it is unclear if and when the company plans to roll out the functionality across its entire catalog. As for other app upgrades, Kindle for iOS now offers the ability to use previously purchased dictionaries as sources to define words in any other ebook. Purchased dictionaries are automatically recognized and become available for definition lookups in the selection list. The app also includes new accessibility gestures for blind and visually impaired users, while the "Instant Cover Loader" displays book cover art faster than previous versions. Finally, the app comes with the usual bug fixes and performance enhancements. 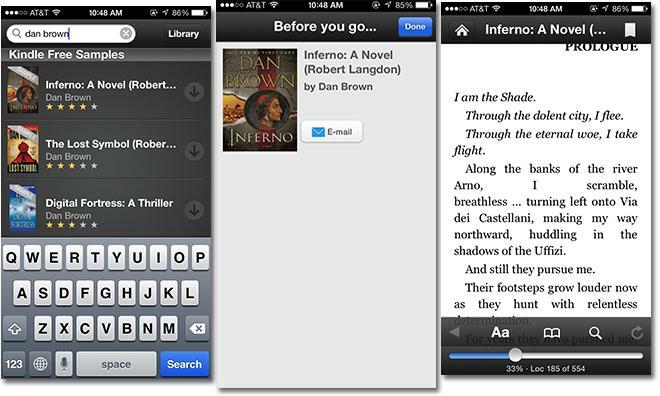 Kindle for iOS is available now as a free 18MB download from the App Store.